Unbeknownst to many conventional minds, Frank Zappa was a multi-faceted national treasure. Zappa the mad scientist composer moved freely between rock, doo-wop, fusion, reggae, avant-garde, and orchestral music. Zappa the social satirist skewered everything from Flower Power to televangelism to the valley girl patois. Zappa the indie label founder produced highly original albums by Wildman Fischer and Captain Beefheart that otherwise never would have seen the light of day. Zappa the activist spoke out against record labeling before Congress and jousted with a frothing fundy on a famous episode of "Crossfire." Zappa the world citizen was appointed cultural emissary to Czechoslovakia in the middle of the Velvet Revolution. And Zappa the lead guitarist was a force to be reckoned with. Over the course of 25 years, Frank Zappa's hot leads graced a sprawling catalog which included the strictly instrumental "Shut Up 'N Play Yer Guitar" series and the fretboard-heavy "Guitar." Unlike many rock guitarists, Zappa read music, and went beyond the Pentatonic to use a wide assortment of scales, modes, and voicings. 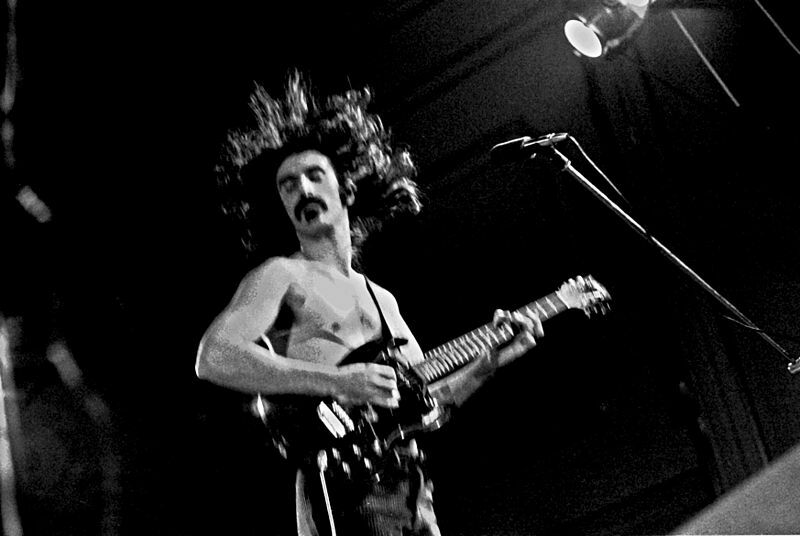 Asked what he sought in a guitarist, Zappa said he didn't want "a Mongolian string-bender." Where some solos (e.g. the solo for "Smells Like Teen Spirit") serve as extensions of the main melody, Zappa's solos were compositions in themselves--he once called them "air sculptures"--which took songs to new and interesting places. First up in this embarrassment of riches is "Black Napkins." The best-known version is on the studio album "Zoot Allures." Below is one of many alternative renditions on YouTube. Notice Zappa's finger-tapping at the end. Within a couple years, Eddie Van Halen would refine and popularize the technique, thereby spawning countless faceless hair metal imitators. The solo on "Inca Roads" which comes on at 2:01 was patched together from live jams and seamlessly woven into this long, suite-like studio piece. "Montana," an L.A. boy's vision of life in flyover land, features a solo at 1:55 which feels shot out of a cannon, backed by a cooking rhythm section. A nice little touch is the lead poking its head in to double the chorus about fifteen seconds before the solo proper starts, hinting at what's to come. The ever-resourceful Zappa took a live solo (from a 1978 performance of "The Torture Never Stops") and added sparse studio instrumentation to create "Rat Tomago," my earliest introduction to Frank's commanding lead voice. All we hear is a guitar, drums, and a softly droning bass line in the background, but the sound is larger than life - wave upon wave of grand, thematic guitar lines that end suddenly with the words Oh, listen to him go. The best visual snapshot of Zappa's six-string prowess is this live version of "City of Tiny Lights." The song is not one of my favorites, but things shift into high gear when the solo comes on at 2:12. From the aerial image of Terry Bozzio's balls-out drumming to the opening shot of Zappa striding across the stage in platform boots (with a spotlight overhead and a long shadow trailing behind) to his communion with enthusiastic front-row fans, the ironic eyebrow arch at 3:10, and a fretboard's-eye view of Frank's blazing chops at 3:23, this is a feast. When it comes to electric guitar, it doesn't get much better than this. Click here for "The Second Coming: Stevie Ray Vaughan"
A high octane tribute to Zappa that absolutely nails it; a disciplined romp of a review that has so many (obsessively detailed, but in a GOOD way) spot-on facts about Zappa and his music; a tribute that's so much fun to read, so appetizing, I can't decide which YouTube link to hit on first. But I know it will be all of them. Thank you, Dan! Read your article/posting on Romney-Ryan ticket, came by way of War on Women on Facebook. Well written and wonderfully footnoted. Thought I would peruse the other posts. Frank Zappa, wonderful! You should hear our public radio station from Spindale NC (I live in SC). They have Frank on Friday -- think it is at noon or one. Super radio station. WNCW-- know you can stream it. Listen to the Frank on Fridays every chance I get! A very good and accurate homage to the world's most talented stringbender. Just a small correction ---the Inca Roads solo is not actually an example of xenochrony, as it was taken from a live performance of Inca Roads. Still, cheers! Thanks for the information about "Inca Roads," Anonymous. I will update this post. Actually, Inca Roads the basic tracks were recorded from the KCET television studio gig in 1974 and the guitar solo was from the Helsinki concert in 1974 and it was edited from that one guitar solo not patched with any other... Enjoy! And it should be noted that the solo from Inca Roads also makes up the titular songs on the Shut Up N Play Yer Guitar series in addition to Gee I Like Your Pants, on the same series. A nice read for any Zappa fan. "Rat Tomago" was transcendent for me, taking me from "Hey I'll get an album or two" to "I MUST HAVE IT ALL"
The solo on "Zombie Wolfe" is a favorite of mine, mostly on account of FZ's use of the whammy bar. City Of Tiny Lights... I've listened to dozens of versions so far, but I have to say that I like the Sheik Yerbouti's one - the best. I love it all, thank you! I listen to Muffin Man a lot. Maybe not FZ's best guitar work technically, but cranked up in the car - DAMN! Just sends me to another place every time. Cruisin for Burgers from ZINY is another one that I really gets into my soul. A lot of the guitar work on YCDTOSA2 - Pygmy Twylyt! this is great stuff it does'nt get much better than this kind of guitar work!